Having a flourishing garden is one of the best things you can ask for in the farming world. A garden with so much produce, you don’t know what to do with. One thing we always seem to have an abundance of in the summer is tomatoes. We love it. But it gets to a point, and I think we are hitting that point now, where you have so many, it’s hard to use them all up before they go bad. 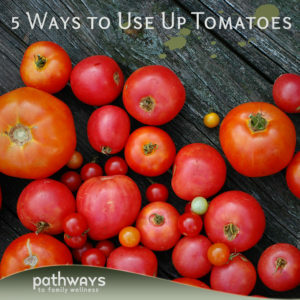 Here are some great recipes and ideas to use up your plentiful garden ripe tomatoes. Ever since I was a kid I loved salsa. I used to chow down on the jarred variety we would get from our local co-op. And occasionally when our friend came over to make authentic enchiladas, would we be gifted with her homemade salsa. I always loved helping her in the kitchen dice up the tomatoes; squeeze some lemon or lime into the mix; and give it a taste to recommend more salt if needed. Before I knew it I was doing everything myself and was able to share this recipe with my family whenever we craved the fresh variety. The other day an Italian friend came over. We had a few too many tomatoes on the counter and a baguette that needed to get eaten. 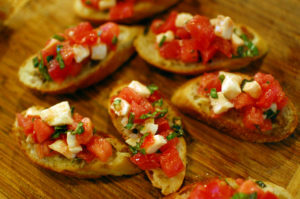 Unsure of what to make for dinner, the idea of bruschetta arose. 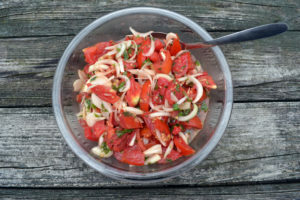 Have some tomatoes, fresh basil, onion and garlic? You can make the most basic bruschetta. As long as you have fresh ingredients, your end result will be delicious. This time, we opted out of the mozzarella (simply because we didn’t have any), and added a drizzle of balsamic to the final product. It was delicious. Another Italian recipe, except this one stems back for a couple generations. Simple and delicious, and a great way to use up a ton of tomatoes at once. This will also stay fairly well and gets better as it sits. We tend to make many batches of this throughout the summer. It pairs perfect with a grilled burger, on a fresh salad, or just as is. This recipe, we have not yet revisited, but hope to very soon. This was not a recipe I personally discovered, but one that was given to us. 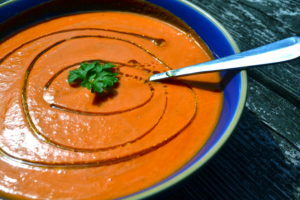 A combination of fresh ingredients blended together to create a delicious cold soup. It has been very hot lately, and this would be the perfect cooling substitute for your regular cooked meals. Alright, alright, your getting sick of tomatoes. I get it. 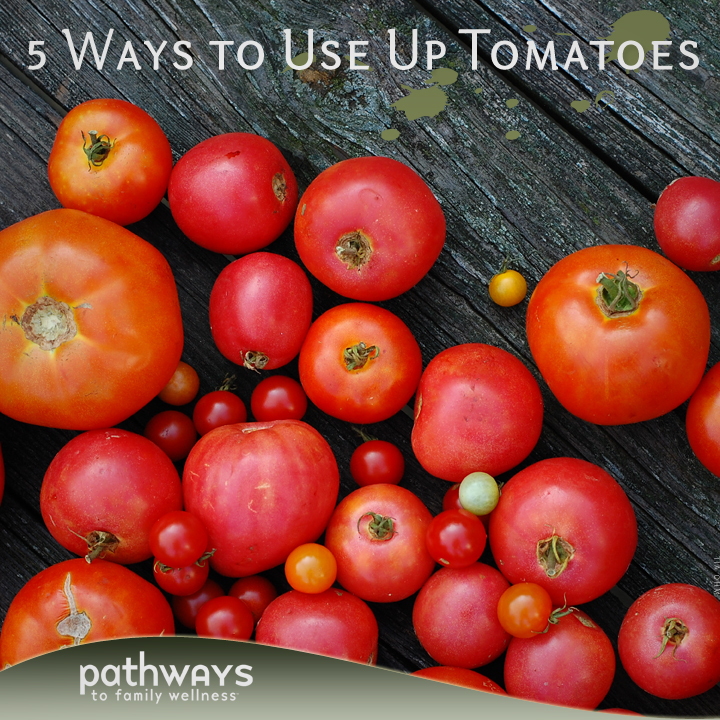 Don’t care to make anything else with tomatoes; at least not for a little while? Take them, chop them, and can them just as is. This is a perfect way to store your tomatoes for you to revisit in the winter months when these lush red beauties are not so plentiful. 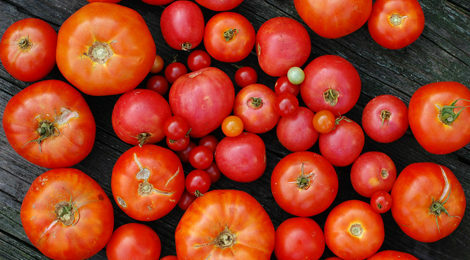 Open a jar and make some fresh tomato sauce with them. 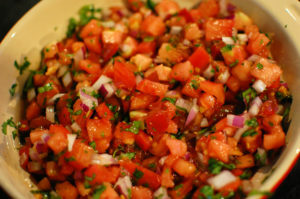 Dice them up and make a cooked salsa. Add them to a stir-fry, or better yet a hearty beef stew, and you’ll taste the freshness of summer in the depths of winter. I don’t have a recipe available for this one, but there are plenty available around the web.